A little out of focus, but in my defence, the damn thing was ten feet away and fairly whizzing along. 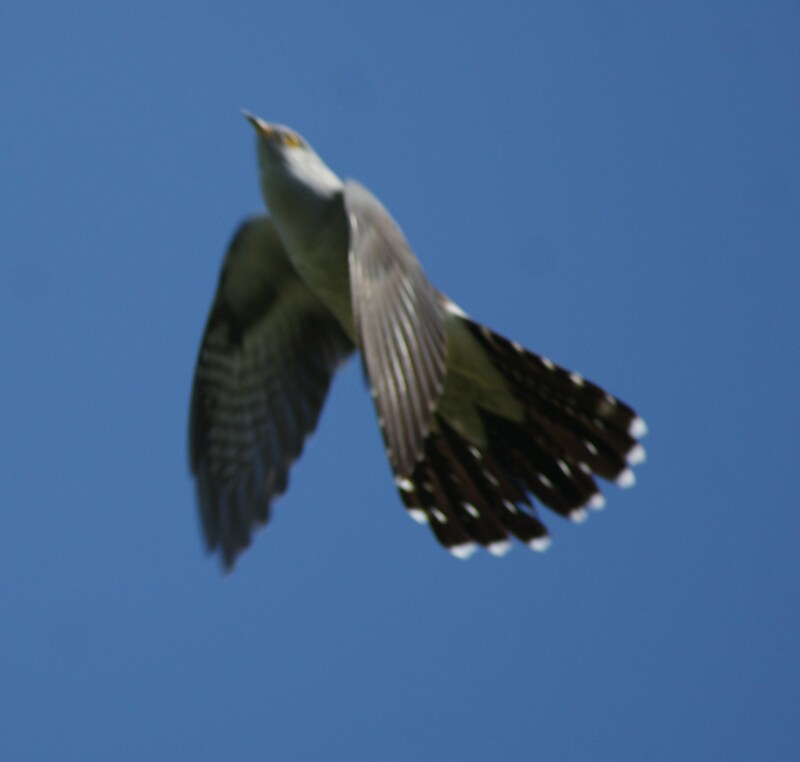 I don’t want this blog to become stuck on my attempts to take a decent photograph of a cuckoo, but I thought the above was worth including as part of my gradual progress towards success. Calling cuckoos is actually surprisingly simple, and the fact that these birds can be so easily tricked is maybe linked to the fact that in Scotland, they were traditionally called “gowks”, a word which later was used to describe stupid people. This one (above) flew right over my head as I called, and even after he saw me, he continued to circle round and round me for twenty five minutes. I eventually gave up because my hands were hurting after calling constantly, but I saw no evidence that he was prepared to stop circling. 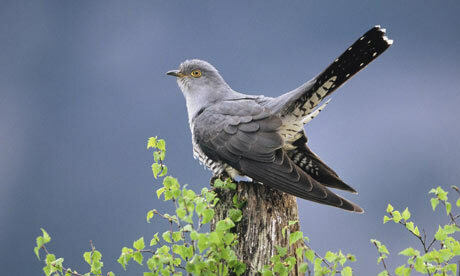 The RSPB has made cuckoos a red list species in the last year, owing to their massive declines across much of England. Those declines don’t seem to have bitten up on the Chayne, and I have heard at least one every time I have been up to the farm since I heard the first last week. During an early morning lek visit last Saturday, I heard five cuckoos on a two mile walk, all far enough apart for me to be sure that I was not hearing the same birds twice. When you look at the habitat on offer on the farm, it’s hardly surprising that we are covered in cuckoos. Acres of rough grass are filled with hairy caterpillars which provide food, and meadow pipits which provide appropriate nest sites. With the RSPB blaming farming for everything that seems to go wrong in the world of birds, it’s a pleasing counter argument to see cuckoos and galloway cows living side by side on the agricultural slopes of the Chayne. The last few days have brought more and more cuckoos to the Chayne. I heard five different birds calling yesterday when I walked my circuit of traps, and I was even able to call one out of the thick cover by blowing into my hands and imitating the familiar call. He landed a hundred yards away and bobbed up and down on a stone on the horizon. He was there for a few seconds, but I managed to take this photograph, above. Cuckoos certainly are weird birds. This is the first photograph I have ever taken of one, and I hope that, over the next few weeks, I can manage to take some better ones. A legal larsen, complete with food, fresh water, a perch, a unique identification number, a steel rain shelter and adequate space. A shelter from the prevailing wind was taken off to allow the photograph to be taken. The past ten years have seen new laws piled upon the countryside to such an extent that it seems like we are totally bound in red tape. The sheer volume of “do’s” and “don’ts” turns even the simplest task into legal minefield, and a gamekeeper needs to be as good a lawyer as pest controller. The governments of Scotland and England have fallen into the practice of “convoy legislation”, an expression derived from the fact that Second World War merchant navy convoys were always limited to the speed of the slowest ship. Convoy legislation caters for the slowest witted person, treating everyone at a base level of ignorance. Larsen trap legislation in Scotland is a prime example of convoy legislation, putting into law a series of pointers which should be total common sense. Why it should be a legal requirement to give your call bird food and water is a mystery. It is not only a moral requirement, but a practical one. A dead crow will not attract any others, so why would you operate a trap unless you were prepared to keep your call bird alive and well? By law, call birds need to be provided with perches so that they can roost. Giving a bird a perch will allow it to bob around inside the cage, making it far more conspicuous and attractive to others, so why wouldn’t you give your bird a perch? It’s not difficult. Providing shelter from the wind and rain is a legal requirement. After a downpour, crows will want to fly around to dry themselves off, increasing their chances of seeing your call bird. They will not spot your bird if it is cold and wet, hunched miserably on its perch, so why shouldn’t it be kept dry? Even a single broad plank of wood is enough to give your bird some shelter. Operating a larsen trap humanely and effectively does not require legal guidelines; it requires a little common sense. The fact that laws have been brought in means that some people lack even the most basic common sense. It is not hard to imagine that a walker finding a dead call bird in a cage trap will be relatively unimpressed by his discovery. His response will be to slam larsen traps as cruel and barbaric instruments which need to be banned. Hyperbolic organisations (I would give a prime example, but that would infer that they have some credibility) spring up, demanding the abolition of all larsen traps, and they are reasonably fuelled by images and videos of suffering related to live catch bird traps. It would be a major mistake to ban larsen traps. I have been running three on the Chayne for the past fortnight and have cleared up a large number of territorial crows which would otherwise have been searching through the undergrowth for the eggs of any number of ground nesting birds. Many of the bird species on the farm are nationally and internationally endangered, so pest control in this case is totally above moral reproach. The fact that I have had to register my traps with the police was a minor inconvenience, but the theory behind this compulsary requirement is actually quite sound. Larsen traps do not need to be banned, but some of their operators do. There is nothing inherently cruel about a live catch trap, and the only humane issues relate to how well the bird is being looked after. I believe that unless you take good care of your call bird, you might as well not bother trying to trap, because wild crows will not be interested in a call bird that is hungry, thirsty and cold. 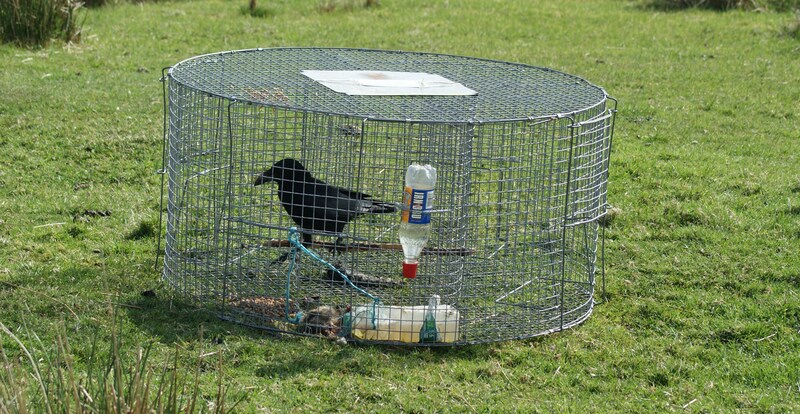 In principal, if every badly treated call bird could be traced back to a single trap operator, as is the intention of the new scheme, that operator could be banned from keeping larsen traps. The new scheme will only work if everyone registers their traps and applies a little commonsense. Sadly, there are some rotten eggs in the world of gamekeeping and land management, and if it can help by weeding them out, it will strengthen the reputation of these important traps. The blaeberry has begun to flower again after a long winter. Comparing my dates, these flowers are out somewhere between ten days and a week earlier than they were last year. 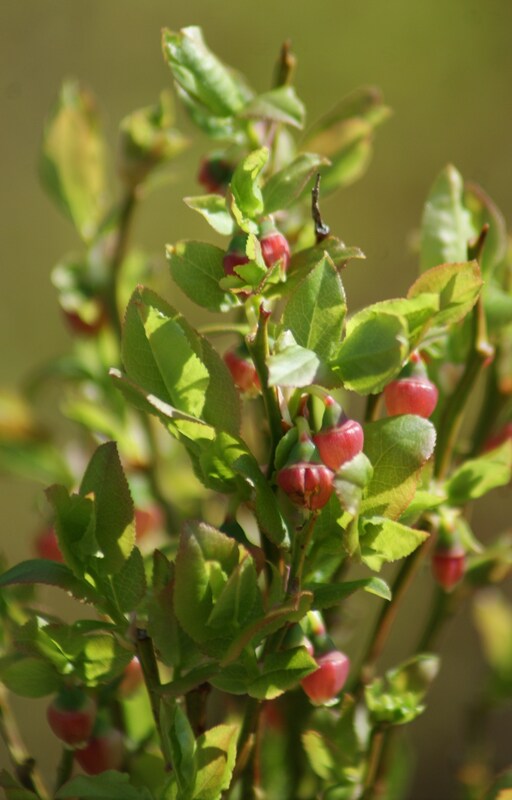 The hot weather over the last few weeks has really hurried everything along, and it shouldn’t be long before these stiff pink flowers become juicy blaeberries. In amongst the undergrowth, I also spotted two emperor moths this morning as I checked my traps. One was dead after having had its head bitten off by something, and the other was perched on a stalk of blow grass without a care in the world. I am still amazed by these moths, which impressed me with their size and beauty when I first saw them last year. Almost 19" long and weighing just less than a pound, this stoat is the biggest I have ever seen. Trapping continues on the Chayne, although the last few weeks have seen a major drop-off in the number of weasels being caught. For a short period at the end of March, I was catching several weasels a day, but with the exception of the occasional straggler, the traps have been ominously quiet throughout April. After spending this morning planting a few last-minute scots pines and aspens in the new wood, I walked my circuit of fourteen Mk.4 and Mk.6 traps on the way back to the car. Having found that all traps were unsprung, I headed for home along a well-used track which took me past a final Mk.4, set at the base of a gateway where I caught my ermine at the start of March. Peering into the gloom of the covered box, I saw that the trap had sprung, but it was so dark inside that I couldn’t see what I had caught. As I moved the stones and turfs away from the roof of the trap box, I saw that whatever I had caught was so large that it was blocking the tunnel altogether. As the timber roof came off the trap, I looked down on a seriously impressive male stoat. Having got used to dealing with weasels over the past few weeks, a stoat was always going to look big by comparison, but this brute was a real monster. After taking him out of the trap and resetting it, I took him home and compared him to the ermine which is still sitting in my freezer. He was four inches longer, measuring a fraction less than nineteen inches from nose to tail. On the scales, he weighed in at just under a pound, making him not only the largest stoat I have caught so far, but also the largest that I can find any record of in reference books. Although he was in his summer coat, he still had several longer white hairs along his sides and flanks which suggest that he was white just a few weeks ago. After almost five months of trapping stoats and weasels on the Chayne, I have learned a huge amount about these fascinating predators. The GWCT predict that on decent heather moorland, numbers of trapped stoats will roughly match the number of weasels. However, the Chayne can in no way be described as “decent” heather moorland, and with a predominance of grasses and rushes, weasels were always going to be more abundant. That said, I had not expected that I would catch more than eight weasels for every stoat. From what I can gather, stoats are generally solitary creatures, and they stick very closely to their territories. I wonder if I will start to catch more stoats in the vicinity of where I caught this monster as his subordinates begin to move into his territory over the next few weeks. It seems relevant to mention that I heard my first cuckoo of the year yesterday, then heard two calling on the darkening this evening. Cuckoos are known for being shady and elusive characters, and before I began this project, I could count the number of times that I had seen one on the fingers of one hand. 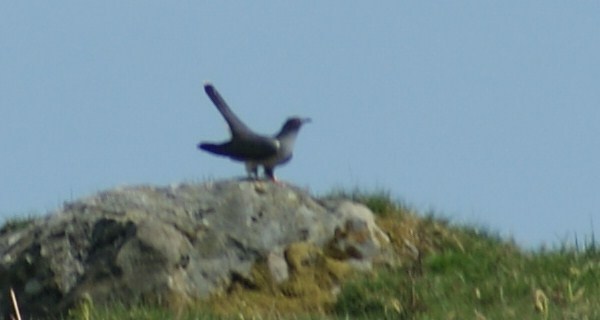 For some reason, the cuckoos on the Chayne are extremely conspicuous, and by May, they should be a common sight on the hill again. They are known for eating hairy caterpillars, and rubbing off the irritating bristles by scrubbing them on branches and posts. Given that the undergrowth is now alive with fox moth and drinker moth caterpillars, there will be no shortage of food for them this summer. I will try to take a photograph of one this year, but until I manage it, I’ll have to make do with this photo which was found on Google. The further away we move from the illusion of death and lifeleness which was so apparent in December and January, the more interesting things become. The seasonal aggression and territorial behaviour of crows is playing against them as, day by day, they vanish into my larsen traps, while lapwings, curlews and oystercatchers are establishing their breeding grounds with an audible energy. Everything is vigorous, lively and fascinating on the moor, and the last week has taken it all up another gear. Birds are changing their behaviour to become more conspicuous than at any other time, and my nightly lamping trips are now played out to the fantastic backdrop of constantly drumming snipe. Walking through the heather yesterday morning, I disturbed a large pale shape from the undergrowth infront of me. My first reaction was that it was a juvenile hen harrier, but the loping wingbeat and honey-barred feathers pointed beyond all doubt to the fact that I was looking at a short eared owl. I was absolutely delighted. I have only ever seen one short eared owl on the Chayne, at that was almost fourteen months ago. They are the most beautiful of our birds of prey, and as it cruised further on to the hill and landed about a quarter of a mile away, I was furious for having left my camera at home. I did notice that it was carrying something as it flew, and I decided to have a look and see what it had been doing in the heather when I disturbed it. My heart sank to find a red grouse feather. And then another. A large patch of feathers swirled in the long grass, and part of the carcase was lying on a mound of moss. The owl had been feeding on one of the pair of birds which I have been keeping an eye on since late Autumn, and had Photographed For This Blog In November. I had held high hopes for that pair, and the glory of seeing a short eared owl vanished instantly. Handling the remains, I found that the flesh was cold and that the sinews were stiff. My first reaction was to blame the owl, but it seemed unlikely that it had been responsible, given that it was feeding a kill which seemed to be hours old. There was no doubt that it had flown away with part of the grouse, but I was increasingly unsure who was responsible for the death. After a brief exchange of emails with Mike Groves, an expert on short eared owls from Angus, I can now fairly well dismiss charges against the owl. 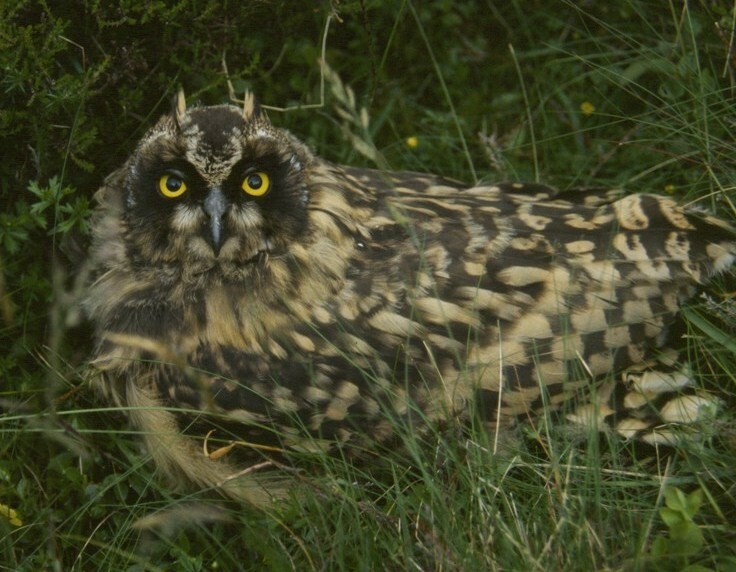 As Mike points out, short eared owls weigh considerably less than red grouse, and they prefer tackling easier and less challenging prey, like voles and small mammals.